Tourist Visa denials are very common in certain parts of the world. In fact, there are countries where it is virtually impossible to obtain a Visitors Visa to the United States. Under a recent Calculation of the Adjusted Visa Refusal Rate for Tourist and Business travelers under the Guidelines of the Visa Waiver Program, released by the State Department we can learn some very Interesting Statistics. How can Visitors Enter the US? The most common way is by Applying for a Tourist Visa, B1/B2. Some countries though can travel Visa Free under the Visa Waiver Program. The Visa Waiver Program enables nationals of certain countries to travel without a visa to the U.S., when the intended travel is for “B” visa purposes (tourism or business) for stays of 90 days or less, if the traveler meets certain requirements. What is a Visa Denial? blish his or her eligibility, either because the application does not meet the requirements of an established visa category, or because there are grounds for ineligibility based on other aspects of the visa case. A visa refusal is the formal denial of a n onimmigrant visa application by a U.S. consular officer acting pursuant to the Immigration and Nationality Act. Can I fight a Visa Refusal? 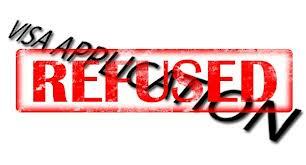 Some visa refusals can be overcome by the presentation of additional information. “Overcomes” are cases in which an initial decision to deny a visa or suspend processing in a visa case is overcome by the new information or changed circumstances that establishes an applicant’s eligibility for the visa (and the visa is then issued). Some visa refusals require a waiver of ineligibility which must be approved by the Department of Homeland Security before a visa may be issued. Why are some countries allowed to travel visa free and others not? Some countries have a very high rate of tourist visa Refusals and such countries are considered high risk for Visa Waiver. A country’s visa refusal rate is just one of the criteria considered when determining a country’s eligibility for Visa Waiver Program status.